Three so-called drifters who confessed to killing two people in a brutal crime spree in 2015 were sentenced on Tuesday. 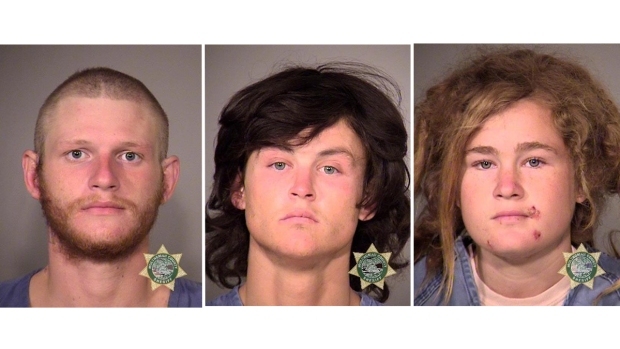 Morrison Haze Lampley, 24, of San Francisco, and Lila Scott Alligood, 19, of San Rafael, in February pleaded guilty to killing a Canadian tourist in Golden Gate Park and a Marin County therapist in a park near Fairfax. Lampley admitted to discharging a firearm and was sentenced to 100 years to life in prison. Alligood, of San Rafael, is eligible for a youthful offender parole hearing after she has served 25 years, Deputy District Attorney Leon Kousharian said. As part of their plea, the two defendants waived their right to appeal the convictions, according to Marin County District Attorney Edward Berberian said. Three so-called drifters who confessed to killing two people in a brutal crime spree in 2015 will be sentenced on Tuesday. Pete Suratos reports. Third defendant Sean Angold, 25, pleaded guilty to second-degree murder and was sentenced to 15 years to life in prison. He testified under a grant of immunity against his two co-defendants at their preliminary hearing in September. Berberian said the disposition of Lampley's and Alligood's cases was reached with extensive discussions with the families of the victims. Several members of Carter's family and Carey's aunt spoke at the sentencing by Marin County Superior Court Judge Kelly Simmons. Lampley's expression never changed as he walked into court and looked down throughout the sentencing. In contrast, Alligood, his former girlfriend, cried through most of the testimony from the victim's families. "As far as I’m concerned, no punishment however harsh could do justice to the horrific, unforgivable crime that you three have committed — fully intentional and, as far as I’m concerned, without any remorse whatsoever," said Lokita Carter, the wife of Steve Carter. Then it was Alligood's turn. "I feel so much guilt and shame for the wrongdoings and the hurtful decisions that I made and I’m sorry," she said. Angold's attorney read a statement in which his client said he will spend the rest of his days remembering the wrong he's done. He also begged the victims' families to forgive him. A statement read by Lampley's attorney said he wished he could go back in time and change things. Lokita Carter said she had seen Lampley's letter before it was read aloud in court, but "it left me with nothing," she said. When asked if the sentencing will bring closure, the Carters' friend Christina Dejongh replied, "I don’t know if I will ever have it. My feeling is what can compensate for an act like this? I sort of even don’t relate to the punishment." "Vengeance," Dejongh said, won't "bring him back." Carey befriended the trio in Golden Gate Park, and Lampley shot her in some bushes where they were smoking marijuana, according to Angold's testimony at the hearing. Angold testified he heard gunshots, and when he asked Lampley what happened, Lampley replied, "She's dead dude, don't worry about it." The trio left with some of her belongings, Angold said. Angold also testified that the trio wanted to steal a vehicle and head to Oregon with the intention of growing marijuana. They encountered Carter as he was hiking with his dog in the Loma Alta Open Space Preserve near Fairfax. Angold testified he heard several shots but did not see Lampley shoot Carter and his dog about 30 feet away on a trail because his back was turned. Angold said Lampley took the keys to Carter's Volkswagen Jetta and blood-soaked money from Carter's pocket. He said Alligood drove them from the scene and he threw the gun, which had been stolen in San Francisco, out of the car's window. Carter's dog survived the shooting. Angold also testified the trio was using methamphetamine, marijuana, heroin and LSD in the days before the murders. The defendants were arrested in a church dining hall in Portland, Oregon, on Oct. 7. They were tracked there by the Jetta's GPS. Defense attorneys attacked Angold's credibility at the preliminary hearing and his grant of immunity to testify against his co-defendants. They also cited Angold's admission during his testimony that he has a history of blaming others for the crimes he has committed, including a residential robbery in Los Angeles and thefts from a Wal-Mart store. The three defendants were apologetic during the two-hour sentencing in Marin County Superior Court this morning, and Alligood broke down during her brief statement, Kousharian said. None of the defendants made any references to the facts of the case against them, Kousharian said.